Moving from Illinois to Daggett, MI, Carl bought 80 acres (two 40’s) for $1600.00 from the land agent. The land was not “virgin forest,” it had been cut years earlier, (that is called “cut-over” land) but there were many younger trees to cut. The soil was fertile, so it was worth the effort to clear the trees. Roy Westman, whose family was their next door neighbor in Daggett remembered that a fire had gone through the area three to four years earlier so there was lots of brush to move also. On the positive side, the land was still rich with lots of the berries which follow a forest fire. Carl came up first to start preparing the land. He stayed with the Peter and Jurda Westman family who owned the 80 acres immediately to the east of the Aderman land. 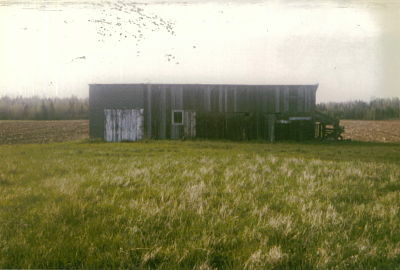 The Westmans had already built their farm, but were isolated from everybody else until the Adermans moved up. Carl “took his meals” with the Westmans during the several weeks of his first stay. After studying the land, he determined where to put the buildings. The machine shop Carl built and first lived in. His first building was a shed made of 2x4s and drop siding. This became his temporary home and later was used as a granary and shop. He also worked to clear some of the land. At night, he would go back to the Westmans and sleep on a cot in their unfinished upstairs. The room had bare rafters and a rough lumber floor. It was here that the Westman children watched him “smoke tobacco”. To read more about life on the farm, read this article written by their son, Edgar, who was raised on the farm.